My mom in front of her childhood home. I love old photos! I love the white borders; I love the tinge of pink or yellow; I love the vintage outfits and hairstyles. They’re an amazing glimpse into the past! 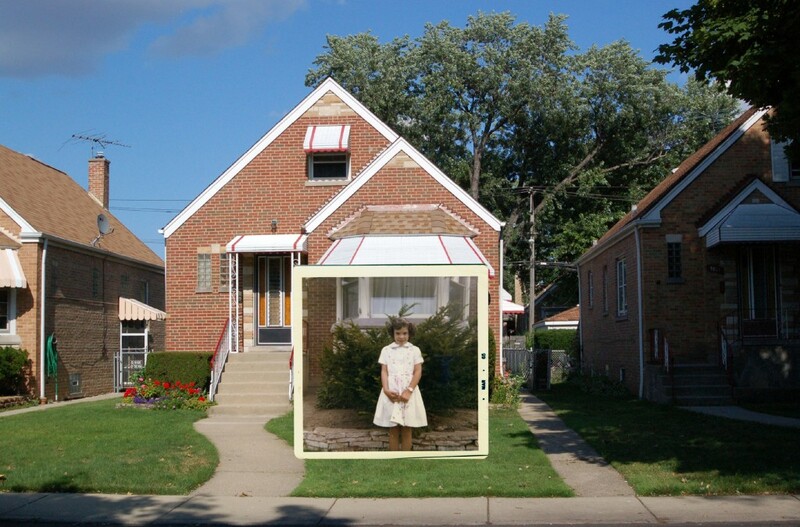 On a recent visit to Chicago, I brought a stack of my parents’ old photos along. Though my dad’s family didn’t move there until he was in middle school, it’s where my mom was born and raised. Greg and I used the photos and a few addresses to take a great tour of the city, visiting their old houses, schools and churches. 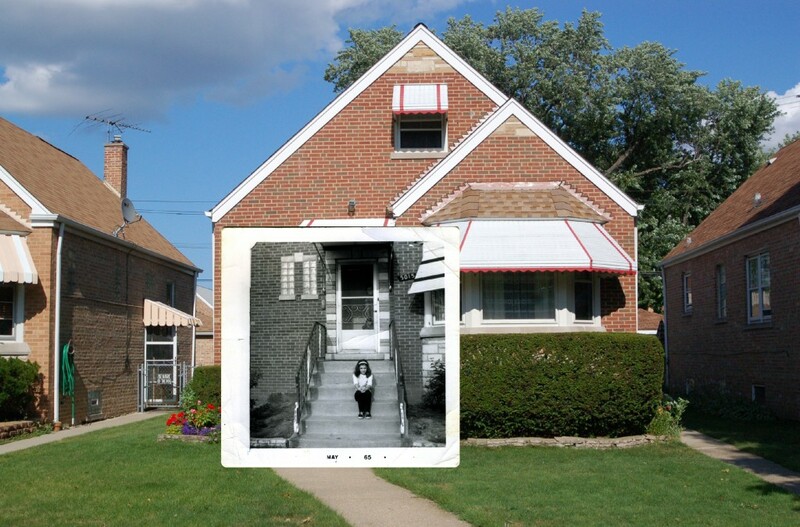 We used outdoor photographs to find exact locations where moments in their lives happened. My mom on the steps of her childhood home with her mom and sister at the door. I knew I wanted to make a photo project out of the trip, but wasn’t quite sure how. I started with holding the old photos in front of the current places and shot them, hand and all. (I’ve since discovered this awesome group on flickr with great examples.) Holding the photo and getting the perspective exactly right was extremely difficult! I ended up in neighbors’ yards taking shaky photos. 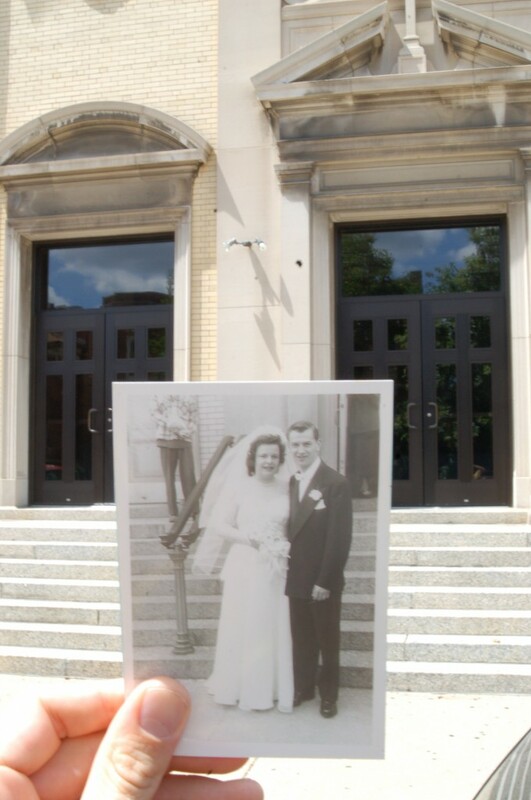 My grandparents in front of the church on their wedding day. Finally, I settled for just shooting the places in their current state. Once home, I scanned the original photos and laid them over my new digital shots. I did minimal color correction, rotating and resizing. Sometimes I tried a dozen photos and just couldn’t make it work. Sometimes I used the photos side-by-side because stacking them hid the most interesting changes. 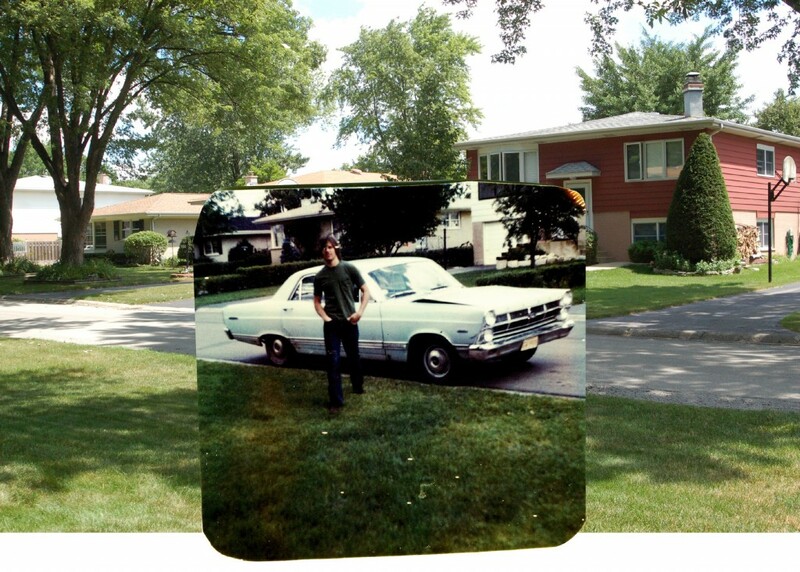 My dad in the driveway of my mom’s high school home. I love seeing how the places changed (or didn’t)! I put the whole collection into a book and gave it to my mom. It was fun to make, fun to give and hopefully fun to receive. Just one framed photo like this would make a great gift — and there’s plenty of time until Mother’s Day! 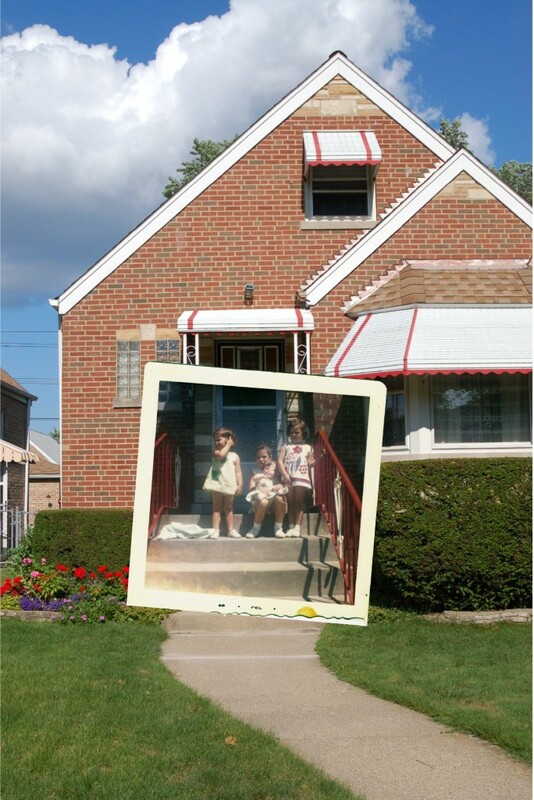 My mom and her sisters in front of their childhood home. What a neat project! So happy you bought the wubbanub for Emme! I almost did too. She’ll love it! Such a cute idea!! You are so thoughtful!! I absolutely love this book! I am so thankful for it. One of the best gifts I have ever gotten. You always seem to come up with just the right creative idea.